This module is to learn about basic image filtering. It was developed to allow students to instantly observe the effects of different filters and their parameters on live video. The module implements a variety of filters using OpenCV. Each filter exposes some paremeters (e.g., kernel size) that can be set interactively to understand their effects onto the filter behavior. Either try it with JeVois Inventor using YUYV 640x240 @ 30 fps. 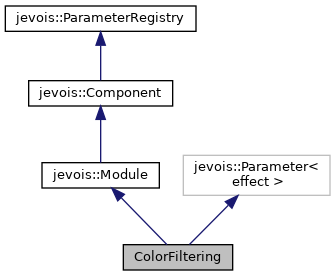 Note that each time you select a new effect, this will affect the set of parameters that are available for that effect, but currently JeVois Inventor has no way of being notified of that change. So just click to another tab (e.g., the Info tab), and then back to the Parameters tab each time you change the effect. This will refresh the parameter list. Start by setting the effect parameter to a given effect type. For example: setpar effect Median or setpar effect Morpho (commands are case-sensitive). Then type help to see what additional parameters are available for each effect. For example, for Median, you can adjust the kernel size (parameter ksize). For Morpho, you can select the type of morphological operation (parameter op), structuring element shape (parameter kshape) and size (parameter ksize), etc. With JeVois v1.5 and above, you may want to use help2 instead of help, which is a shorter and more compact help message that shows parameters and commands of the running machine vision module only (and no general parameters related to the JeVois core). Definition at line 117 of file ColorFiltering.C. Definition at line 125 of file ColorFiltering.C. Parameter callback: set the selected filter algo. Definition at line 180 of file ColorFiltering.C. Definition at line 129 of file ColorFiltering.C. References jevois::rawimage::convertToCvBGR(), jevois::RawImage::fmt, jevois::RawImage::height, jevois::rawimage::paste(), jevois::rawimage::pasteBGRtoYUYV(), jevois::RawImage::require(), jevois::split(), jevois::Timer::start(), jevois::Timer::stop(), jevois::RawImage::width, and jevois::rawimage::writeText().